Maggie hosts for the second year in a row. This was a very fun challenge last year, and I quite enjoyed it. Oooh! Definitely pick Bailey White. Laugh out loud funny -- and I was on a cross-country plane ride at the time. I vote for Secret Life of Bees. I loved it last year. sprite - I bought that book after reading a White book for last year's challenge, so yeah! for a good rec already. maggie - I wouldn't miss it for the world. I was looking forward to this one. thanks! Bailey White's book was fun. The Secret Life of Bees didn't quite work for me. 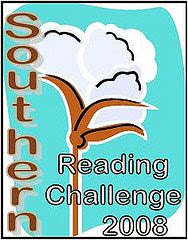 Enjoy the Southern Reading Challenge, y'all, y'hear? CHALLENGE: 2nd Canadian Book Challenge, Eh?